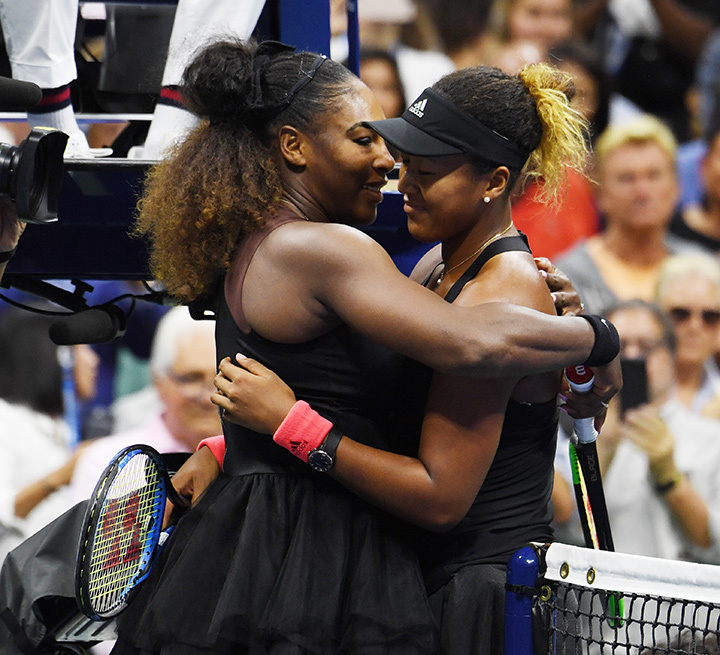 Naomi Osaka made history as the first Japanese women to win a Grand Slam as she held her nerve during a spectacular Serena Williams flame-out on Saturday at the most bizarre US Open final in memory. 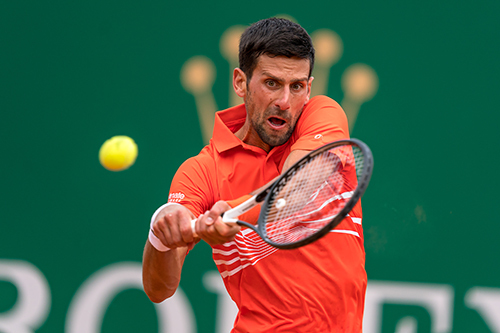 The 20-year-old Osaka posted a dominating 6-2, 6-4 win as Williams – childhood idol of the young challenger – was docked a point and then a game in a smouldering feud which began with a warning for coaching in the first game of the second set. 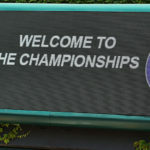 The spectacular Williams meltdown aside, Osaka emerged as a worthy winner, Losing serve only five times in the entire tournament and denying six-time tournament champion Williams the chance to pull level on the all-time record of 24 Grand Slam singles titles. 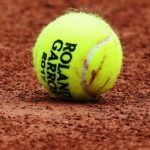 The American failed for a second time to go over the line after losing the Wimbledon final three months ago to Angelique Kerber. 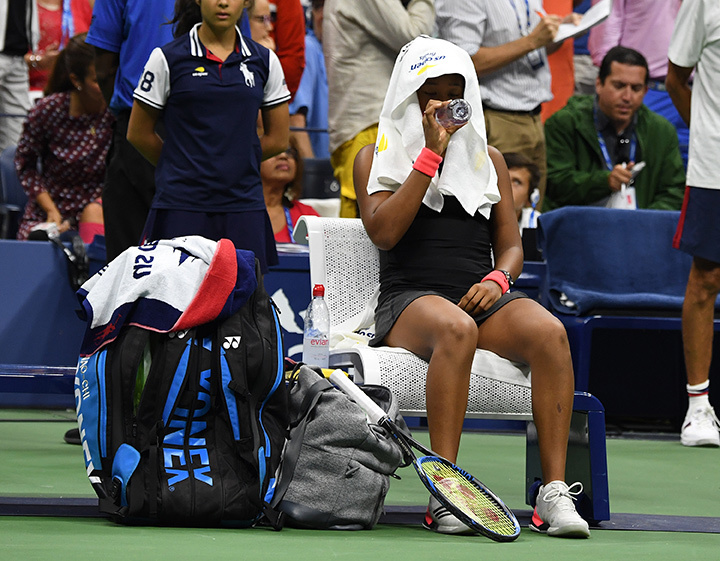 The unprecedented on-court drama began after Osaka had swept the first set in 33 minutes. 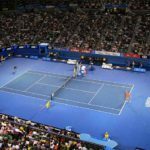 Williams was penalised a point in the second game of the second after Portuguese umpire Carlos Ramos gave her a warning for coaching from her team box. 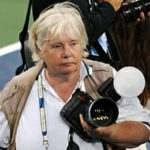 Later, her French coach Patrick Mouratoglou told American television that he had, in fact, been sending signals. 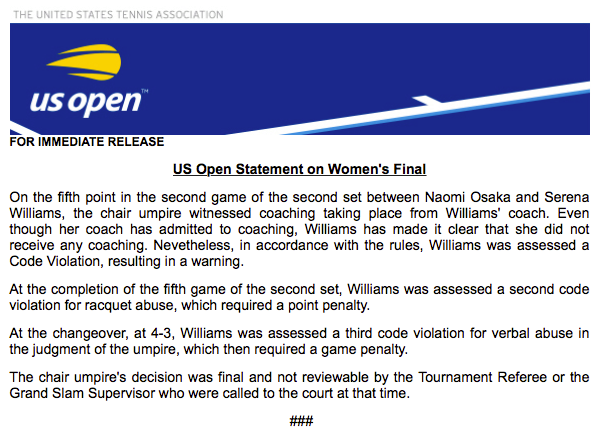 Williams immediately raised her objections: “It was not coaching. I do not cheat to win. I would rather lose. I just want you to know that,” she said to Ramos. 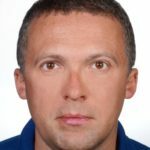 But the situation immediately escalated as the Williams game collapsed in a wave of more bad feeling and name-calling. 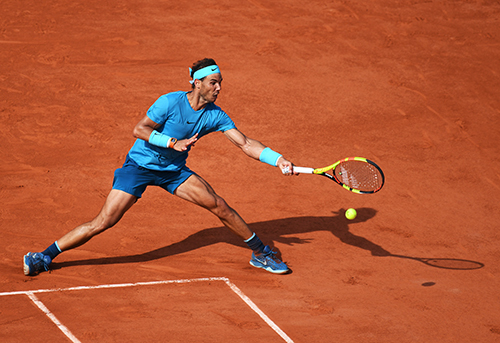 The player who turns 37 at the end of the month, failed to ignite her game due to the accumulation of tension, breaking for 3-1 but losing serve a game later in the second. 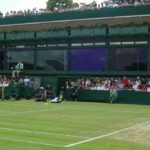 That brought on a racket smash, for which – under the rules – Ramos was forced to penalise Williams a point after her previous warning. 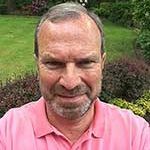 The verbal explosion was Williams – who has had two previous and serious New York run-ins with officials – was instantaneous. “You owe me an apology,” she said to Ramos. “You are attacking my character. 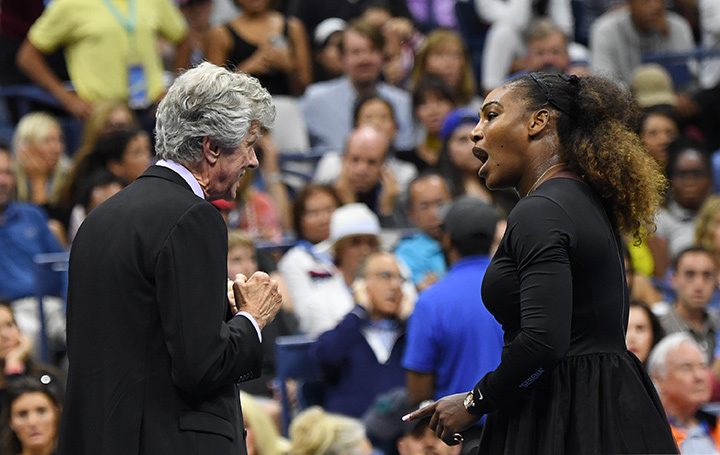 At one point in her rant, Williams berated tournament referee Brian Earley and later did the same to a WTA representative, who told her to try and calm down. Even Williams’ manager Jill Smoller got into the blame game with officials. Williams ended with a game penalty for verbal abuse after branding Ramos a thief; that left Williams to serve trailing 5-3. 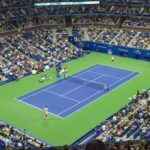 By now, so rattled and seething that her game was in tatters, Williams held one last time before a shaken Osaka – playing on the big stage in her first Grand Slam final – was able to serve out the biggest win of her short career. The Japanese-Haitian set up two match points with her sixth ace, and converted on her second to claim the win. 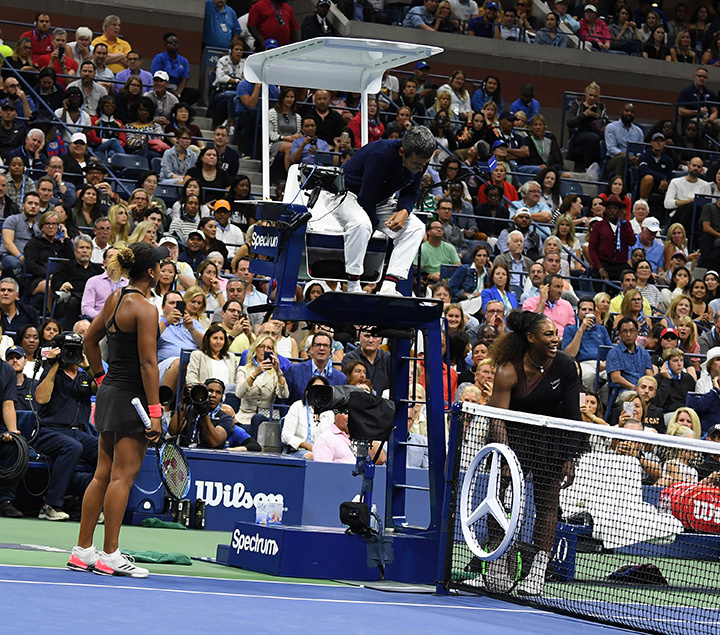 Pro-Williams fans in the 23,000 seat Ashe stadium greeted the result with a massive chorus of jeers and kept it up during the trophy ceremony, while only cheering for their local heroine and booing anyone else who was introduced. 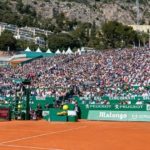 The presentation was other-world, with Ramos banished off-court instead of being presented with the obligatory gift of yet another watch for his work during the final. 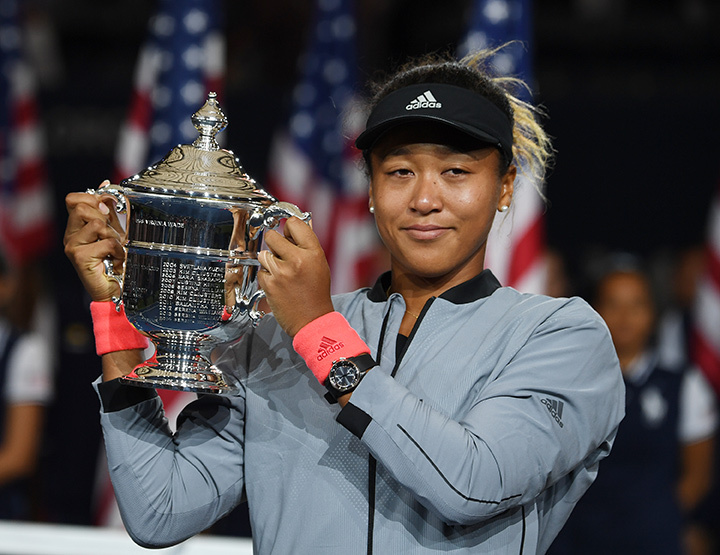 Osaka, trying to make sense of her achievement, was in tears as she waited to receive the trophy in the chaotic, one-off circumstances. 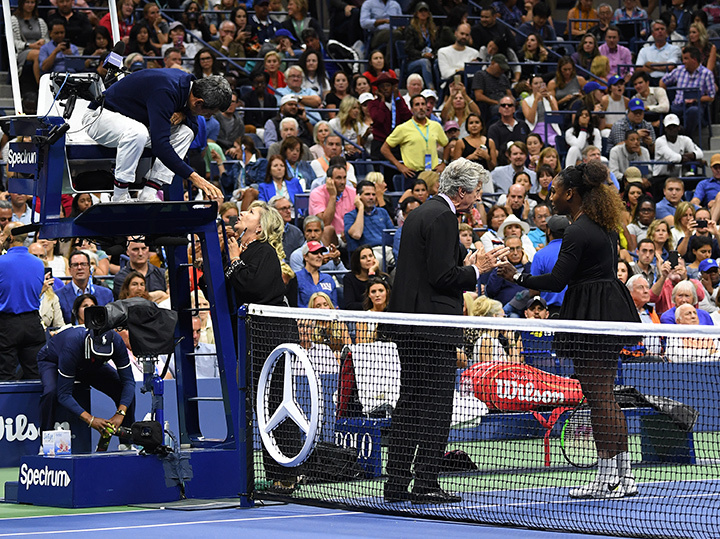 The all but winner broke down again as she accepted the trophy, with fans somewhat subdued after Williams had asked them to stop booing. 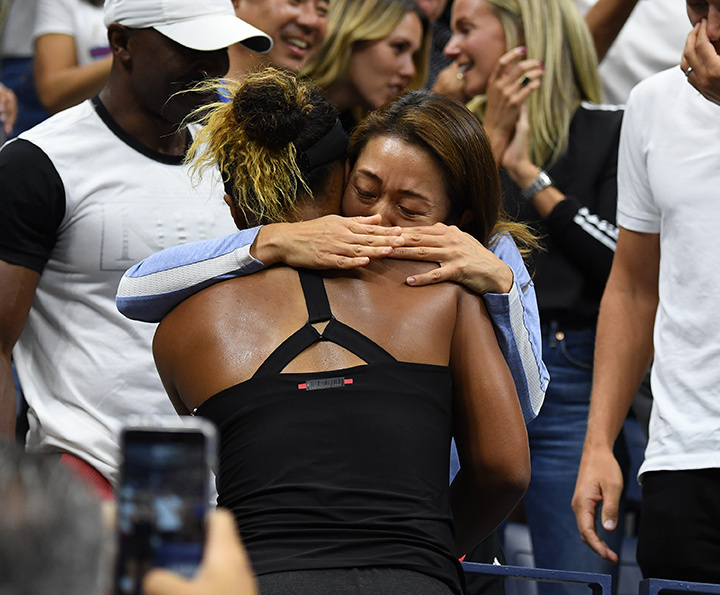 Osaka paid tribute to her Japanese mother Tamaki in the stands, while admitting that her father was always too nervous to ever watch her play; “He’s walking around somewhere, I’ll see him later. “It was always my dream to play Serena here n the US Open final. 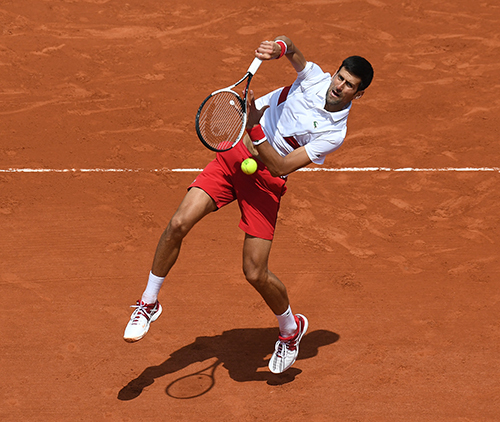 I’m glad I was able to do that, I’m really grateful,” was all that the overwhelmed new champion could choke out. Williams refused to answer questions at the ceremony: “I don’t want to be rude, but i won’t do questions,” she said before asking the crowd to lower the temperature. 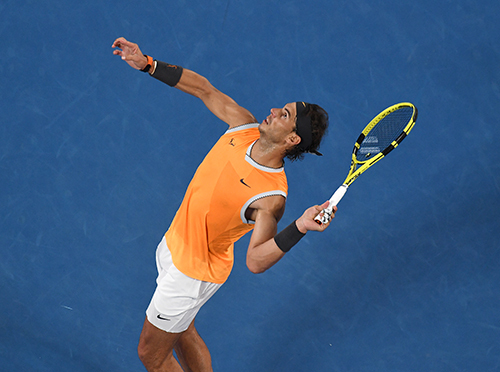 “I know you guys (crowd) here supporting me, but let’s make this the best moment we can – we’ll get through it. 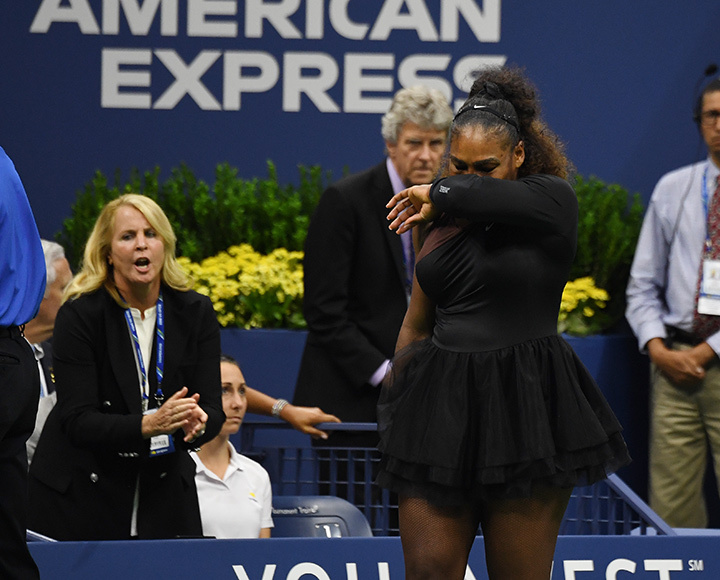 Osaka was the youngest open finalist since Maria Sharapova in 2006; Williams was playing in her 31st Grand Slam final and looking for a 73rd career title. Osaka stands 2-0 over Williams after beating her in the Miami first round last March.